Greenyarn has a selection of yoga socks. All Greenyarn yoga socks feature fine gauge 200 needle count, cushioned sole support and our trademark Eco-fabric. 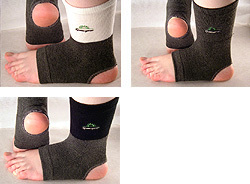 Greenyarn yoga socks are great for aerobics and yoga as they protect the ankles against abrasion on the padded mats. Many dancers, fitness instructors and martial artists use them during training as they also give good support to the ankles. They are anti-bacterial, anti-fungal, deodorizing, absorbs and emits far-infrared radiation, thermal regulating, prevents static build up. The far infrared radiation can improve blood circulation and help metabolism. Featuring fine gauge 200 needle count stitching, these products have towel like comfort that absorb and disperses sweat fast. The other users of these socks include the people who suffer from joint pains at the ankles, as the yoga socks are known to reduce the arthritis and other joint pains significantly.